Stunning rare midcentury ceramic table lamp. Lovely details that show the characteristics of the lamp with a new shade that is included. Red to light brown hues really gives the lamp a mixer of mid-century and rustic features. Stunning midcentury dresser! Wonderful wood details with a lovely walnut stain. 5 drawers, with 6 silver knobs giving a 1960s style! Great antique farm style side table from Europe. Signs of aging but still sturdy. Very low at 12.5" H.
A beautiful red table lamp from the 1970s. The lamp is composed of a heavy red base with a curved chrome stem. The shade can be adjusted by sliding it along the stem. in the style of Philippe Barbier. European socket and wiring. This item will ship from France. Price does not include shipping and possible customs related charges. Unique midcentury table lamp from Stilux, Milano, Italy. 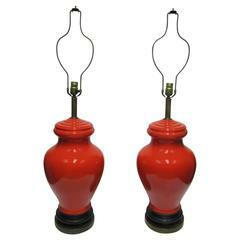 This table lamp features a red frame and a blown glass shade shaped as a light bulb. - 1970s - very good original condition.